Purchase limited to students of the International Business School of Fontys, The Netherlands. © 2018 Maurice Crijns and Peter Biekens. © English translation Fontys Hogescholen 2018. This book was previously published in Dutch by Licensor. 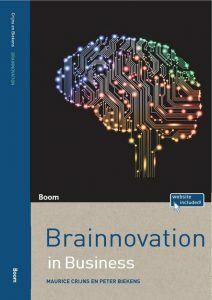 Original title: Brainnovation, creativiteit de verbeelding voorbij by Maurice Crijns and Peter Biekens. © 2016 Boom publishers Amsterdam.